Sometimes things just come together at the right time and fall into place. I feel like that happened for me this weekend. But I’ll retrace my steps a bit…we left Yosemite in the rain, disappointed not to climb there more. Psyche was a bit low. “I don’t really experience those”. Well now I have, and it was strange! A kind of disinterested feeling overcame me and I started to wonder what I was going to do about it and how long it would last. I was sad to leave the Valley and we were heading back to Joe’s so David could try some more on Black Lung (now that his finger has healed). Having already spent some time there I was happy to go for him but for my climbing I felt a bit like I’d done my time there for this trip. We stopped off for a few days in Ibex and, having been trying to understand this new feeling of “meh”, I watched some Dosage 1 (the Ibex bit) to regain some enthusiasm. What can I say? I owe my renewed psyche and hunger for climbing completely to Lisa Rands! Something about her climbing in Ibex helped me find my motivation and so far it has stayed with me! We left Ibex and headed back to Joe’s Valley. Despite my worrying, there was plenty for me to be psyched for. Some in the guide that I had overlooked, some newer things that I didn’t know about before. Having done a lot of the easier classics that I was interested in, my list was predominantely hard stuff. “Oh well”, I thought. “Think of it as training. Even if they are too difficult for me to finish I will have fun trying hard and can only get stronger“. To my surprise, it all came together this weekend and I managed to send Jigsaw (V11) and Milkman Sit (V10/11) on Friday, Man of the Past (V11) on Sunday night and then Dark Matter (V12) on Monday. 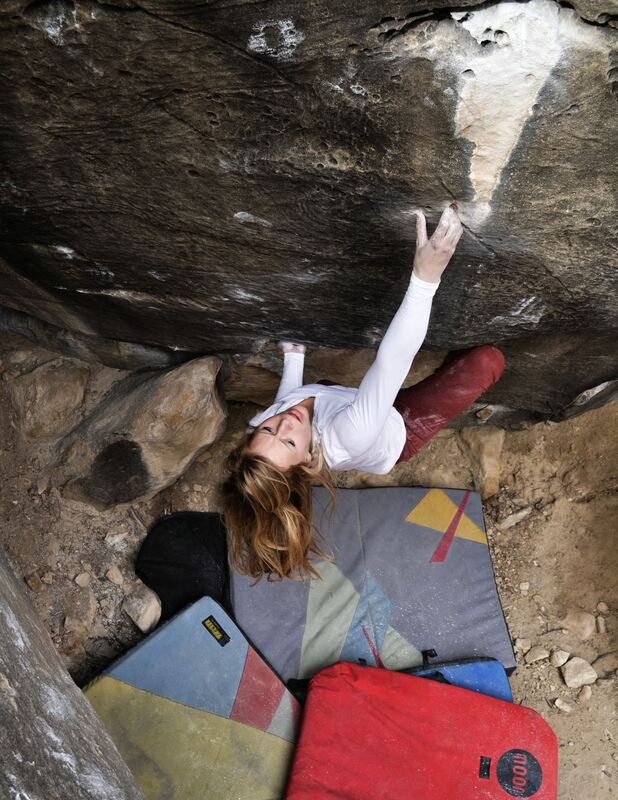 Man of the Past (V11), Photo David Mason. I’m going to have to reorganise my list of things to try! 🙂 Thanks Lisa! hope you take advantage of the cool temps for some end of the trip sends. stop in moab. canyonlands and arches national park are fantastic and you guys would really enjoy climbing at big bend for a few days! I just found this blog. Thanks for the kind words… reading about your amazing sends has inspired me! Keep crushing, and awesome job on Carless Torque! !